The Sandy Hook Child Care Center and Preschool is a fully-licensed, parent-run, nonprofit child care center and preschool located in the Fort Hancock Historic Landmark District of Sandy Hook, New Jersey. Thanks to the center's unique location, our environment is our curriculum. Sandy Hook literally provides us with nature at our doorstep – and our exceptional programs focus on teaching children to respect and love the world around them. Founded in 1980 as a registered 501(c)(3) non-profit organization, the Center has been in operation for over 35 years and remains committed to providing flexible and affordable child care to local families in a loving and intimate environment. We are currently enrolling for both our Child Care and Preschool programs, which have received a five-star rating from greatshools.org. Please contact us for more information. 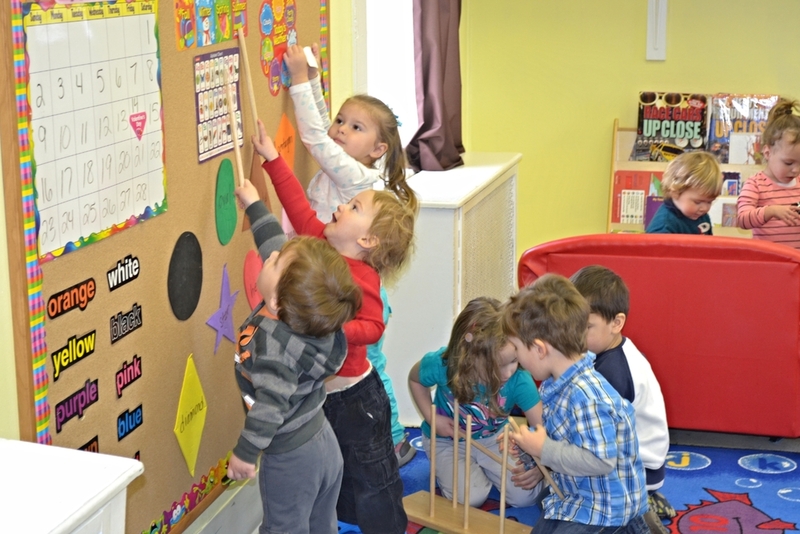 Through our child care program, we provide a safe and nurturing "home away from home" where infants can explore and make new discoveries every day. Young children learn through play, and our day care program is designed to provide infants with the skills that serve as building blocks for a lifetime of learning. Each day is filled with fun activities that excite and help toddlers develop in ways that give them the comfort and confidence to grow and develop both cognitively and socially. As toddlers begin to express their independence, our preschool program introduces them to a world of learning, sharing, and exploring. Our program engages young minds with the early learning fundamentals they'll need as they continue their education, with a rich blend of music, art, and dramatic play. As preschoolers gain more self-esteem, our preschool program enhances that confidence by providing activities to help children become problem solvers and develop a love of lifelong learning. Sandy Hook Child Care Center and Preschool has a unique approach to caring for and educating our children. Our curriculum has a strong emphasis on loving ourselves, our peers and our Earth and environment, and our teachers work as role models helping to reinforce these concepts each day. Children at Sandy Hook Child Care Center are taught at a very young age the importance of respect for themselves and others. Teachers always use polite words when speaking to the children, as well as each other, giving the children the appropriate behavior to model themselves after. Manners are always developed through positive reinforcement, where children are praised for using their “nice words”. The children are also taught to be considerate of one another. The teachers offer explanations of why certain behavior is not allowed, and how that behavior would affect the other children or themselves, thus creating a greater understanding of their own actions as well as their peers actions. Positive relationships are also a main emphasis - we strive to teach the children the skills to communicate effectively with each other and the benefits of being able to work together as a team. Always trying to lead by example, the teachers encourage the children to be sensitive to each others needs and be helpful and caring towards one another. We also emphasize the importance of a child’s sense of security and independence. Children are taught a very young age the skills that will help them grow to be independent and confident individuals. Even the simplest of tasks such as cleaning their place at lunch time, blowing their own noses, or being able to put on their coat by themselves can give a young child a great sense of accomplishment and pride in their abilities. Children are also encouraged to play independently, exploring activities that they enjoy, teaching them the ability to self entertain. Children are also taught the importance of caring for and loving our environment. Through multiple activities throughout the day teachers are able to teach our children the fundamentals of caring for our Earth. These activities include teaching children how to recycle, encouraging healthy eating habits, taking the children on nature walks, gardening, reusing materials, and most importantly allowing the children plenty of outdoor free play time to explore the wonders of our environment all on their own. Lastly, the most important thing we do for our children at Sandy Hook Child Care Center is love them, unconditionally. We encourage them to be themselves and never discourage creative behaviors. We help foster a sense of comfort, security, and confidence in each child, making our little school truly feel like a second home.